Hey ya’ll, this is Carey here, a Program Manager of the YEA Corps initiatives at Unity MNIC. I’ve been providing updates each week on the progress of the Unity Gardens program that launched back in September. Below are updates from the past two weeks on the Unity Gardens, soon to be blooming and bursting with life! The YEA team at Unity works to manage and direct the students towards our project goals, and these students never fail to bring energy needed to accomplish them. We have spent the last two work sessions at the school directing the energy of the students towards painting projects, construction of biofilters, project planning, and engaging worksheets. On December 5th our team, Zach, Saeed, Mike, and myself came to Unity with painting supplies, constructions tools, and materials for the aquaponics systems. We also brought in the first garden bed for the systems. Greg, a student, helped the team to bring the garden bed from the parking lot up to the classroom, which is not as easy as it sounds. The bed is four by eight feet, and however large, fits very well in the project room. 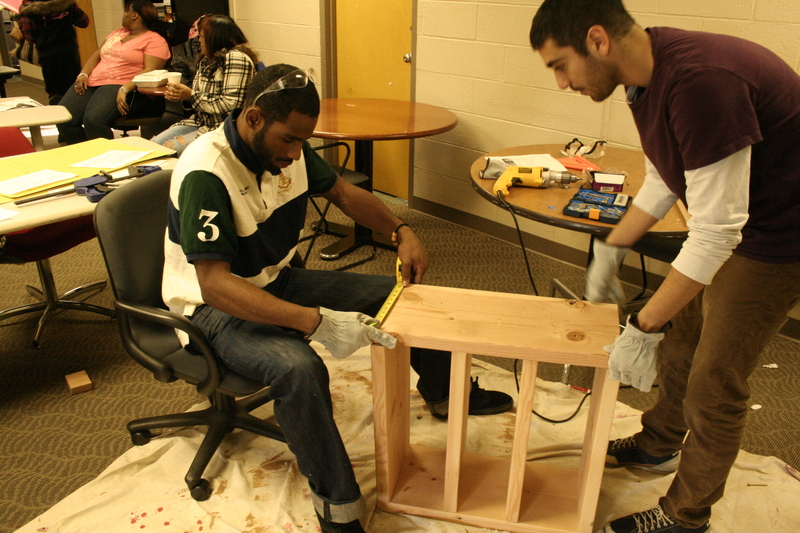 Unity Student, Mike, and Saeed from YEA are constructing a biofilter. Rere, another student, is in the marketing group that focuses on managing media, product design, branding, and other aspects of the project. Last week, Rere was talking about how she was ready to plant and grow vegetables. When the garden bed was brought into the school she asked if we would be planting seeds that day. Students will be planting seeds very soon, but not till after the Holidays. The students are engaging in different aspects of the project but they will all take part in the process of producing fish and plants through the Spring. This project is great in many ways, and one positive aspect is giving the students opportunities to work on a wide variety of subjects. Students like Rere, focus on planning and marketing of the project, and also participate in the more hands-on learning activities. 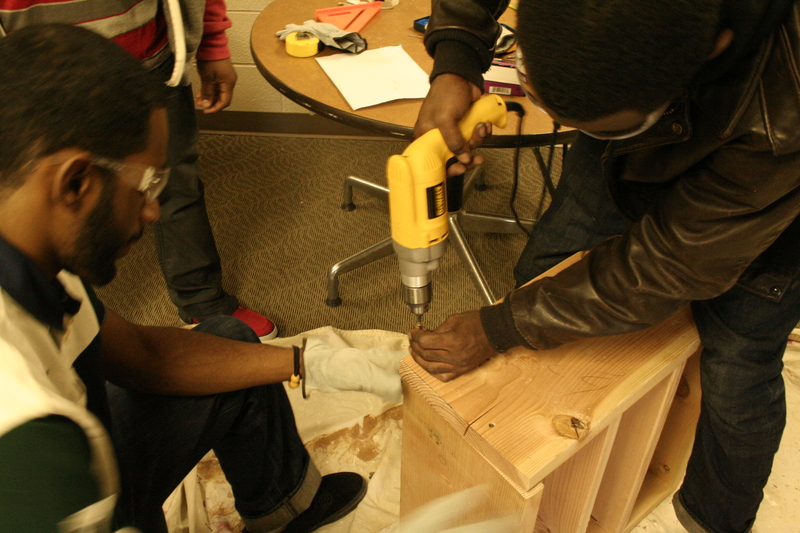 Unity students finishing up the final touches of the biofilter for the aquaponics systems. The following week at Unity, on December 12th, was another busy and accomplished day with the crew. There is a buzz in the school this week around the excitement of the Holidays and the rush to complete schoolwork before the end of the semester. The YEA team got to Unity and kicked the day off with two awesome worksheets on aquaponics construction and sustainability. One worksheet was based off a wood biofilter stand that the students have completed constructing over the past weeks. They answered math-based questions on building metrics and cost of materials. The wood biofilter structure was in the classroom and this made the worksheet more interactive. The YEA team relates our assignments to experiential learning projects, like building a biofilter, and allows us to provide hands-on education in schools. Khyecia, Unity student, brought up a great discussion in our group about the high cost of the wood and screws needed for the biofilter structure. She was surprised about how expensive many of these items were. This brings to light the reality of a business-based project like this, and the realities of expenditure and planning in business. The Unity crew will continue to think about and work on business based situations through the year. 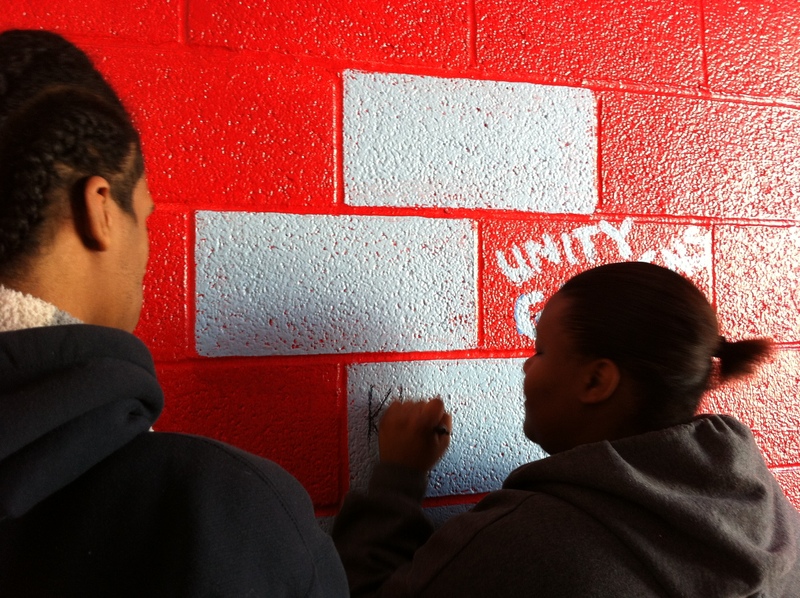 Unity students, Khyecia and Tyland are signing their name on the wall of newly painted Unity Garden room to signifiy the work they accomplished this semester. The YEA team is definitely enjoying our time at Unity Minnesota Internship Center, and the students continue to take on project roles and completing important tasks for Unity Gardens. There is one more week before the Holiday break, and next week we can celebrate what the students have accomplished this semester and look ahead to what will happen next. This entry was posted in Alumni Spotlights and tagged aquaponics, Carey deVictoria-Michel, yea corps by s0luti0naries. Bookmark the permalink.